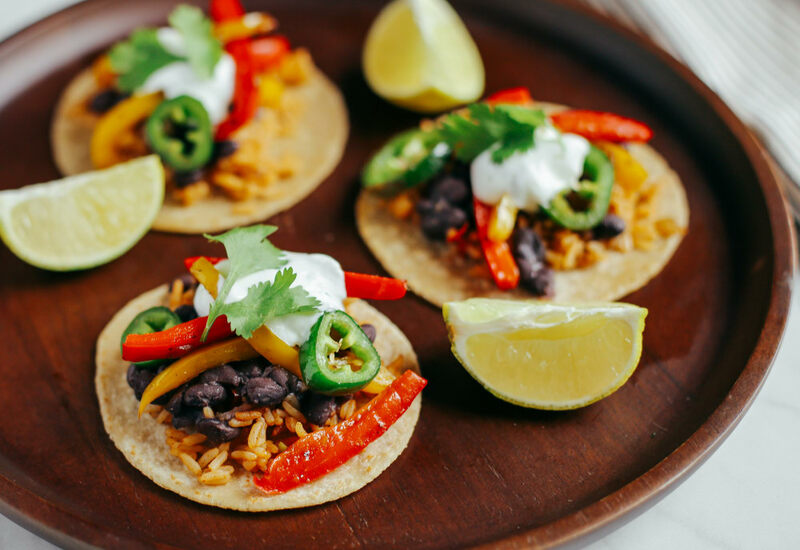 These tacos are filled with beans, peppers, and onion and topped off with a creamy cilantro lime crema for a delicious vegetarian dinner. Serve these to your vegetarian and omnivorous friends alike. They are so good, you won't miss the meat! They are great for weeknight dinner or dinner parties. Crack open a refreshing beer or sparkling water with lime to complete the meal. Make it vegan by skipping the crema, or use a vegan sour cream substitute in place of the yogurt. Substitute cauliflower ice for the basmati rice if you want to reduce the grains and add more veggies. Or substitute quinoa or brown rice for the basmati if you want whole grains! Sprinkle fresh cilantro over the tacos for a burst of freshness. Per Serving: 912 calories; 36g fat; 107.4g carbohydrates; 41g protein; 80mg cholesterol; 3106mg sodium. Using salsa to make the rice is awesome. As I was reading the recipe for the beans I thought "they forgot the bacon," which shows what kind of vegetarian I am. Even without the bacon, this is a winner! And the cilantro lime crema - YUM! I made this dish and the cilantro crema was definitely my favorite part of this recipe! The taco filling was also really delicious, especially with the onion and oregano. I didn't miss the meat at all in these vegetarian tacos. These vegetarian tacos are delicious! I really liked the lighter Greek-style yogurt instead of using traditional sour cream. The taco filling was very good, I would for sure make these again.